"Language shapes the way we see the world". These were the words of my community engagement professor and they have stayed with me through the years and well beyond the four walls of that classroom. As I learn more about aid, international development, global injustices and inequities, these words have gained even more saliency in my mind. Thoughts from Damned Nations still linger, especially those regarding the feel-good rhetoric of humanitarian involvement and many of our own desires to make a difference in this world (whatever that entails). We throw words around like "doing good", "charity", "empowerment", "social change", without a thought to their deeper meanings, historical significance, or the assumptions they bear. And then we act on such conceptions with the presumption of knowledge...a presumption that, on many occassions, can be more damaging than ignorance itself. 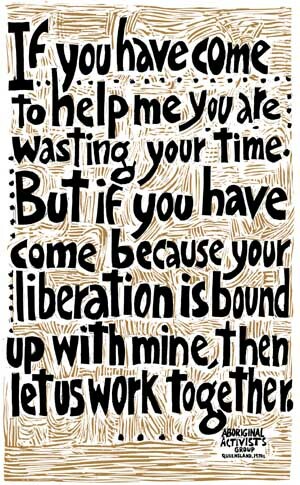 One of the most powerful quotes I've encountered is that attributed to Lilla Watson, an indigenous Australian artist and activist, and one that has become the motto for many activist groups: "If you have come to help me, you are wasting your time. But if you have come because your liberation is bound up with mine, then let us work together". The choice of words in the two sentences may, at first glance, be subtle but their implications and entire messaging are radically different. Power dynamics are changed, dependencies are shifted, and even the result of the effort are dramatically altered. Some may scoff at this and say much of this is just another case of our society's obsession with political-correctness. And I'll admit, the thought has crossed my mind as well. But I honestly do believe that the words that we use and the discourses we take part in shape not only our assumptions about global issues, but ultimately the way we react and respond to them. Just as a small pivot can change one's entire direction, so too can a single word. For those of you who read this post hoping for Extreme's ballad, my sincere apologies. Let me make it up to you: click here.